There is just something intrinsically restorative in the first hours of morning. The earth is positively alive with promise and new beginnings as each dawn awakens. Possibilities seem endless and expectation is infinite. It is the time of day when all of nature instinctively knows it's time to wake up and embrace whatever the hours hold. Freshness and renewal abounds for the wonders of what lies ahead. Energy and enthusiasm permeates crisp, clean air without regard to the prior days' mistakes or successes. As the softest first rays stream through leaves and limbs to offer gentle cues of daybreak the steady sounds of morning can be heard. Pileated woodpeckers high in the branches, Carolina wrens, Titmice and chickadees squeaking closer by. 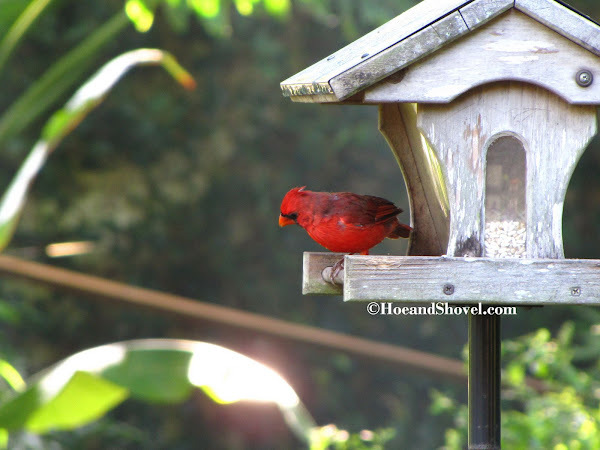 Red cardinals singing their sweet tunes and mourning doves cooing as they wait their turn for the feeders. Egrets and cranes squawk in the distance as hawks fly over eyeing probable prey. Winged creatures buzzing and fluttering everywhere gathering pollen flying-about doing what they were created to do. Eight-legged critters busily repairing their homes with the same vigor as all the other times they have repeated this necessary activity. Magical and mysterious is the start of a new day, yet a pattern so expected we can almost not take notice. Softly, sunlight beams down from heaven in streams of mystically glowing rays. Tangible in appearance. Reaching and luring all at once. As if calling to be touched. Held. Felt. Captured. ... and remarkable details that refuse to go unnoticed. Light, with its power to pinpoint and address ordinarily obscure places, beckons our attention. In the distance, along the trail of the tropical pathway, the blades of the Apostle's Iris 'Regina' catch my eye with their fiery-lit greenery. Shadows and shade surround a stray, angled beam of light isolating a rosemary plant dearly appreciated for its fragrance, flavor, upright form and resistance to heat, drought and cold. 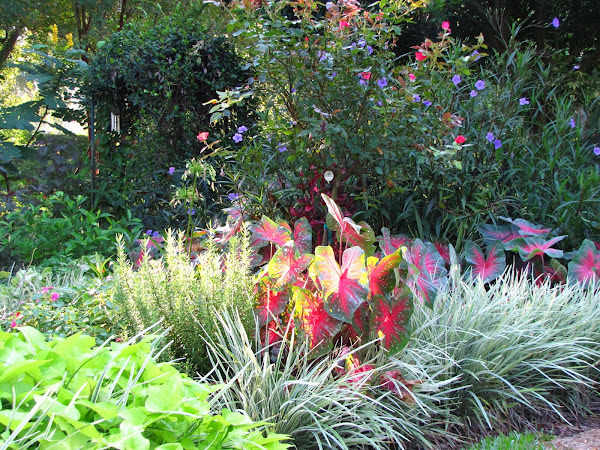 But otherwise plays the small part of blending-in to the more apparent swaths of bright red Florida Cardinal and Red Flash caladiums. 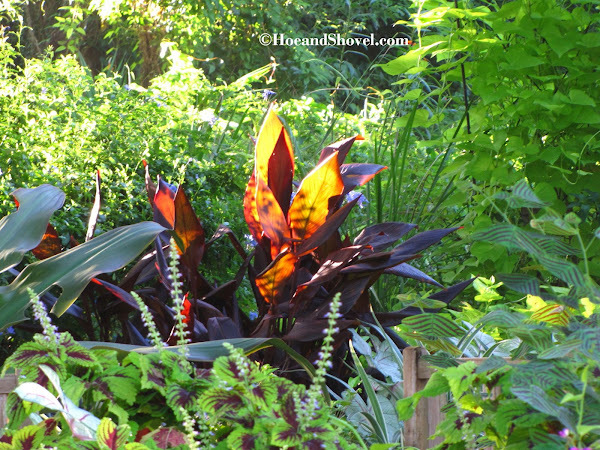 Canna leaves that ordinarily offer a welcomed contrast of color and texture in their semi-shady location turn into flames of fire aglow in the midst of normalcy. Green, white, red, chartreuse, pink, blue ... every color more profoundly enthusiastic in the first gentle hours. 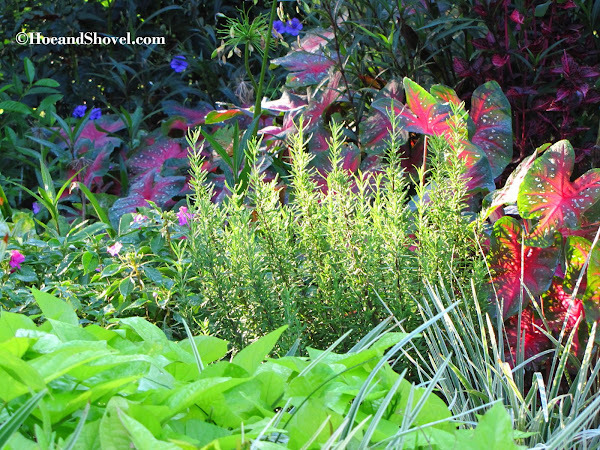 Depending on the vantage point morning's light turns common native plants into captivatingly radiant illuminations. 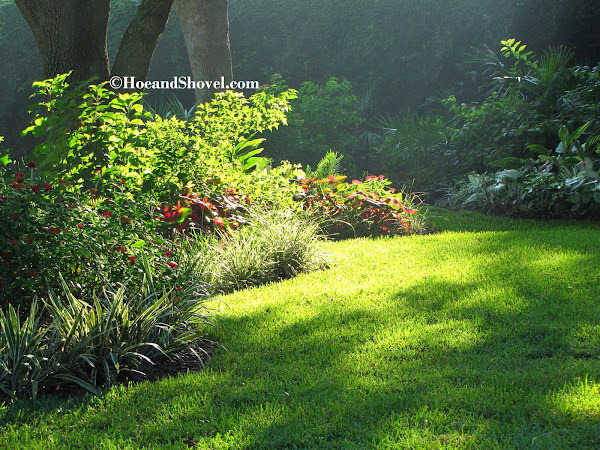 Warm rays of first-light quicken dew droplets turning them into illusions of Christmas lights in the background. Sunlight evolves with each passing moment. Days are already shorter. Autumn is surely on the way with the first wispy blooms of muhly grass beginning to spring out. I don't want to miss a minute of the beauty each season and each dawn brings. So let's not forget to get out and make the most of each day! Each day is God's gift. Oh my gosh, what a delight to see this afternoon. Your gardens make me realize I've a lot of work to do in mine. Your photos are exquisite and really set a wonderful, peaceful mood. I too, believe each day is a gift. What is the shrub material on your fence line? P.S. I loved the scripture for this morning also. Beautiful post Meems. God gives us such beauty to appreciate each day if we but notice it. Love your capture of the morning light. 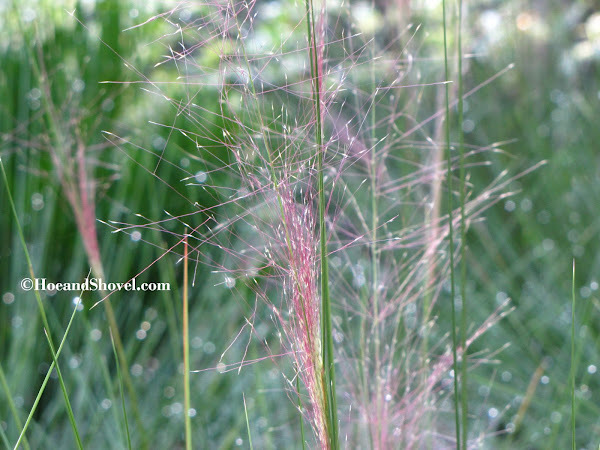 The muhly grass with the dewdrops looks amazing. So beautiful, Meems. It's the morning light that beckons me out of the air-conditioned comfort of my house. I find it absolutely irresistible, and mourn those mornings when I'm forced by duty or lack of time to ignore the call. I don't think you missed a thing. Great selection of a wonderful morning, it's like a new adventure. Love the Red Flash caladiums...just amazing colors. Thank you for the lovely morning walk through your garden. I always feel as though I have physically been there after reading one of your posts and viewing your photos. That grassy shot is wonderful! Isnt it marvellous that we are given the gift of a fresh new morning every day! 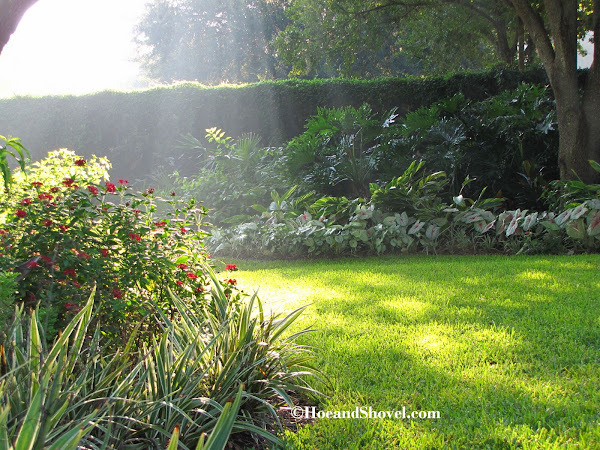 Light certainly brings the garden to life. It highlights all the creatures of the garden. Not to worry... there is always more to do in the garden. Your gardens are a wonderful paradise! The wall on the back property is covered with creeping fig Ficus pumila. Eyes to see and ears to hear... we have to pay attention. I'm SO excited about the muhly coming out! Kindred spirits again. My back porch allows me to stay in my jammies and still enjoy the morning light. The best of both worlds. One never knows the newness that awaits in the garden. I LOVE to take a morning stroll without an agenda in mind. Not as easily done as stated however... the agenda thing. What a nice thing to say. I am one of those wacky folks that can't wait to start a new day. Morning cheeriness ~~~ it will get you going on the right path. Well, today I could feel the humidity coming back but still early morning was lovely. So glad you got out in your garden today. Blessings, friend. And so many forms and shades of light, too. All to be appreciated! Splendid photographs, Meems! The early morning sun is so beautiful. 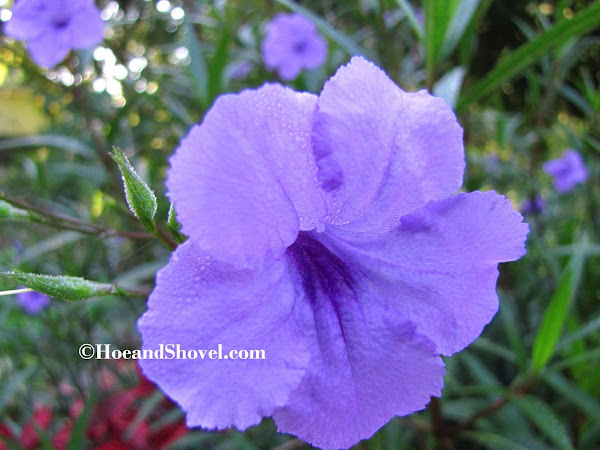 I love that Ruellia, and the caladiums, of course, but, wow, what a wonderful web photo you have there! How awesome to capture her busily building at the start of the day. 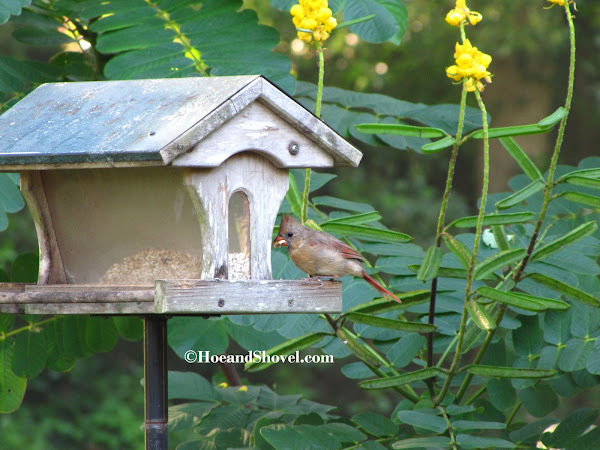 We've had much bird activity here at PITV the last few days, as the rains are taking a break. I heard such unbelievable squawking from a pileated woodpecker in my backyard oak tree yesterday. Quite surreal. Felt as though I were in a jungle. He was a beauty of a specimen, but he disappeared when I ran in to get the camera. 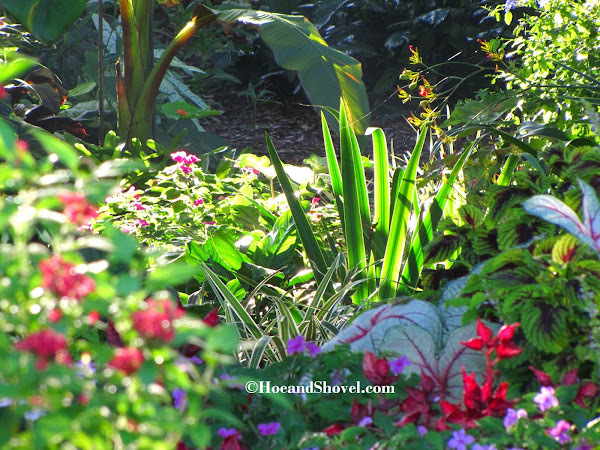 What wonderful photos of your beautiful garden. I love the pink inflorescences on that grass. 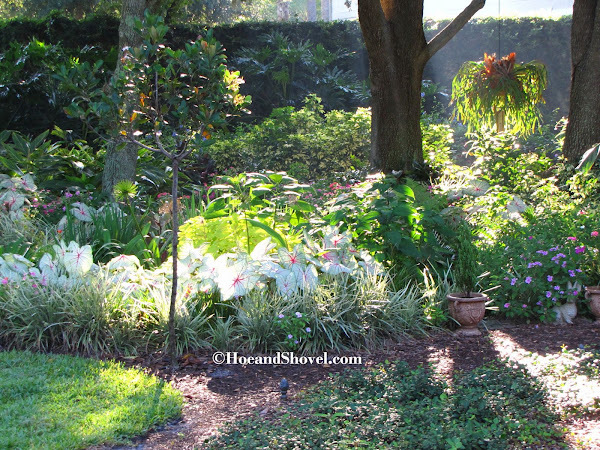 Meems: Your garden just looks so delightful in this early morning sun! 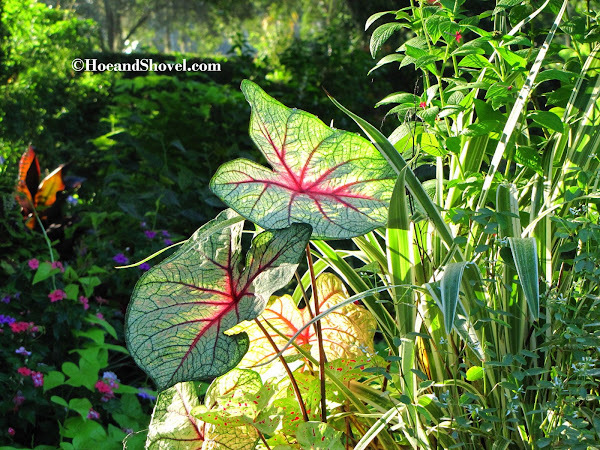 Love all those caladium leaves back lit with the soft morning sun! I have to admit that I hardly get up that early to capture the garden pictures in those early hours. Ususally my morning is hectic with getting kids ready for school and myself for work... Thanks for this beautiful post! The pileated woodpeckers are especially vocal lately. It is one of my favorite calls. Like you say, so exotic. I guess we have so many of them due to the mature oak trees they can visit throughout our neighborhood. The purple muhly grass has the most wispy bloom this time of year. I like it, too. You have your hands full for this season in your life. Right now you may not get outside for quiet moments in the morning but you are giving your boys what they need. You. I admire you for all you do. Enjoy the moments, dear Ami. A wonderful tribute to God and Nature and reminder to enjoy each day. 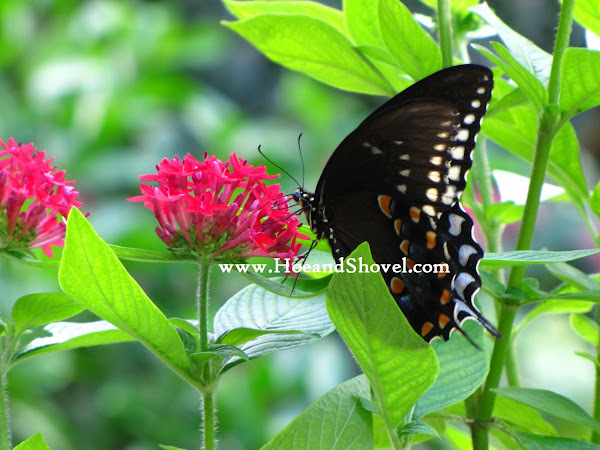 Your gardens and the little creatures who live there, are a delight for us to see through your eyes and descriptions. Have a fabulous Labor Day. Beautiful words, beautiful photos. I've always loved the early morning and late afternoon light - it's mystical and transporting. Well said. It is always a pleasure to perview your exceptional garden. The results of your hard work are always inspiring. Bravo! I know you enjoy the morning hours on your porch, too. I've been intrigued of late with the changing light. Autumn is getting close. I know so many places have been dry. Summer is our rainy season. It's a good thing with the heat we've had. I hope you enjoy your cooling weather. You are so right. Especially now that it is softer and casting those long autumn shadows. Love it. So glad you stopped by. It is a good time of year for the garden. Beautifully written... and I love that scritpure! Each day is indeed a gift to be unwrapped. Thank You for sharing your beautiful gardens and photography skills with us. You made my day and I'm envious of such a beautiful garden. 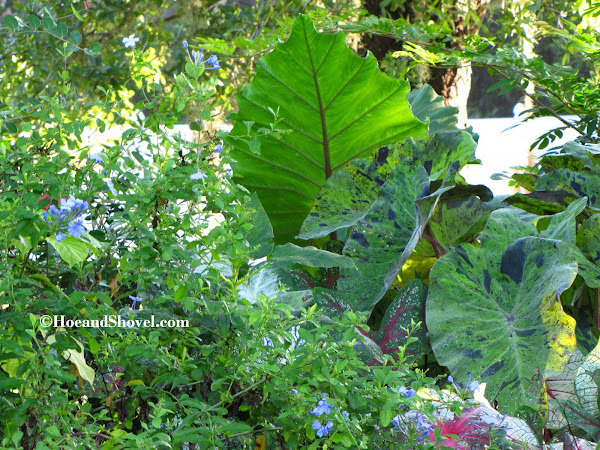 I guess living in Fla. you don't have to dig up the caladiums and dahlia bulbs in the winter to keep them from rotting. How did you manage to plant all those caladium bulbs? Your gardens remind me of Sunken Gardens..a favorite place of mine. St. Pete? I get that confused with something in Silver Spring, Fla. where the glass bottom boat tours are. There is just something breathtaking about those first morning rays....beautiful post. Hi, Meems! Beautiful post! The Muhly grass is pretty and delicate. The birds are so sweet...so much to take in, especially in the early busy hours of the morning. meems...this might be my favourite post ever. i can feel the heartfelt gratitude for a life being well lived. your slice of paradise deserves morning attention and meditations. 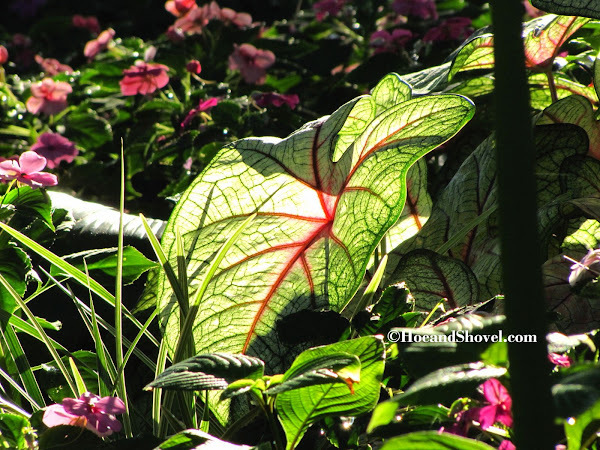 i love the way the sun backlights so many beautiful plants highlighting them just for a few moments to gain our gaze. 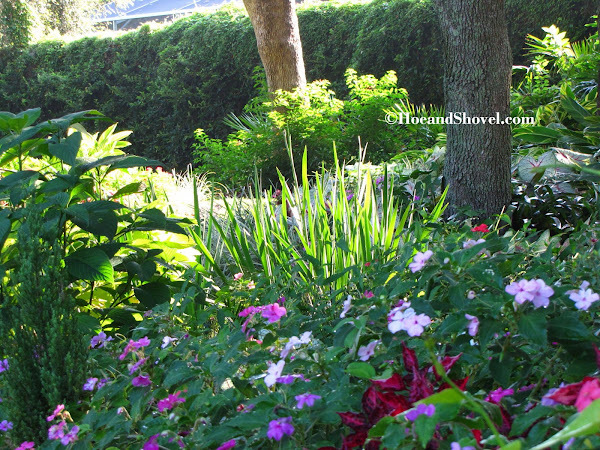 your garden is thriving and so well captured by your photographs in this post dear meems. enjoy your morning times and places to comptemplate God's goodness. You are so sweet to leave a comment! You don't have to create another account... you can use this one... I'll always know it is you. Thanks for your encouragement, dear friend. We don't dig up our caladium bulbs and we don't plant dahlias this far south (at least I don't). It's a good thing... 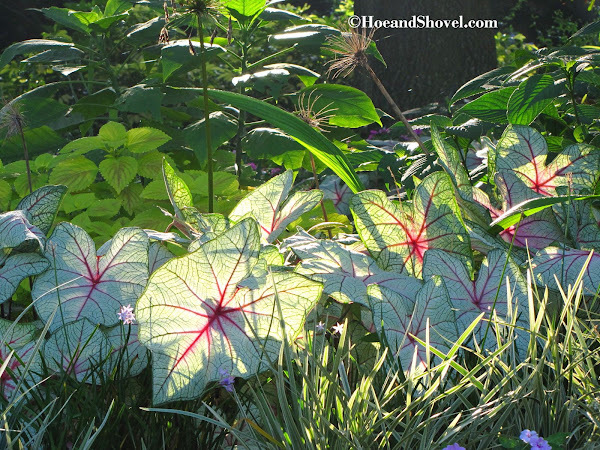 I'd never be able to dig all those caladiums. Sunken Gardens is in St. Pete. and Silver Springs is in Ocala~~ you were right. 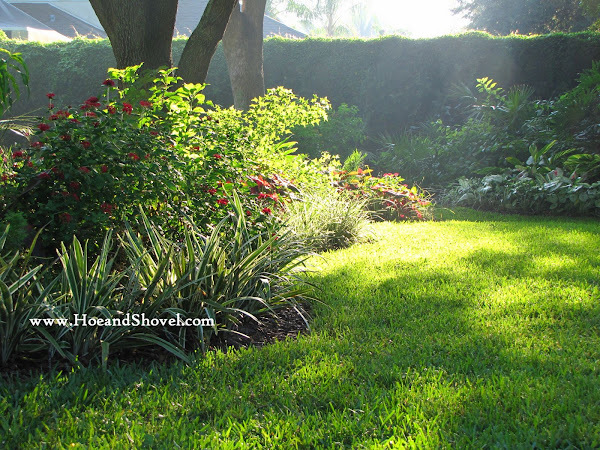 I've placed that muhly grass in the one corner that gets the most sunshine. I'm really enjoying it ~~ and when it blooms in the fall it is magical. Meems, I'm hearing a lot of the F word lately. LOL I'm not sure I'm ready for fall but then if my garden had the cool season exuberance of yours I wouldn't mind it a bit. Just gorgeous, your photos and prose. Dear Meems, Your gardens are magnificent!!!! When I first saw them, I was inspired to build my first garden fashioned after yours. Your pictures are gloriusly beautiful. What an inspiration you are to everyone that gardens!!! Morning is my favorite time of day. I think your photos help to explain why. You begin in the stillness and listen as the world awakens. 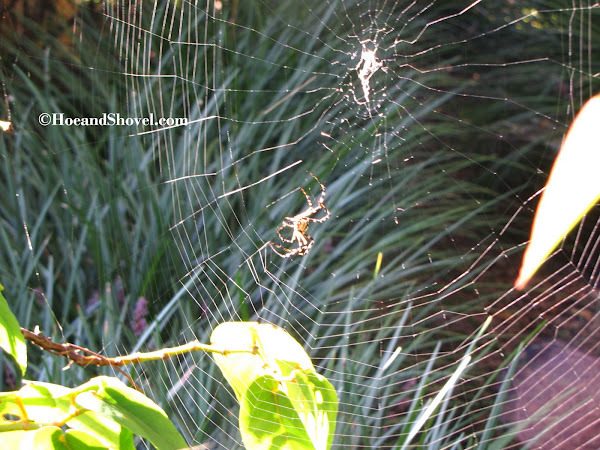 Creatures are out gathering, eating, busy building webs, and nests, and enjoying the new day. We should all take the time more often to just stop and live in the moment of the dawn of a new day. Meems - what a fantastic post! Your morning photos are just incredible!! I totally 'get' your hesitation. Here we are very grateful for even the slightest change from summer's relentless heat and humidity. Although we don't like to complain, it is a welcomed relief when it happens. You are so kind to express your feelings. It is beyond my imagination and I am humbled at the thought of inspiring.Thank you. Thank you for reading and thank you for planting a garden. You will get the deepest rewards for doing something you love. I never want those first moments to end. I always wish they would last all day. You are an early bird,too. There is nothing like it. 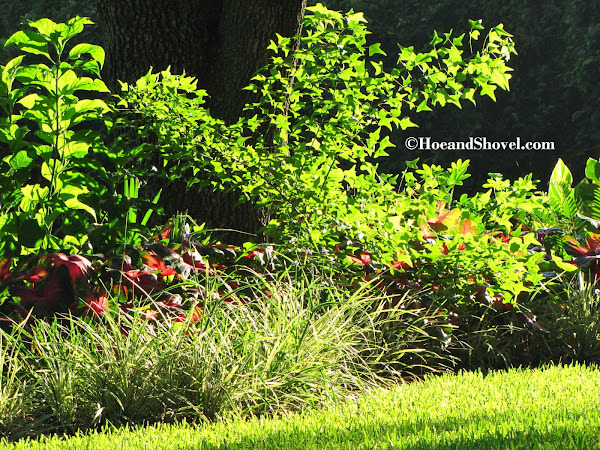 One of my favorite Bible verses and beautiful garden pictures to match. Thanks for sharing your garden with the world. I agree...early morning is full of hope.